Welcome to my home! My beautiful 2 bed apartment, in the quirky area of Chalk Farm, is a stylish and comfortable place to stay and has terrific transport links. You’re just a 4 minute walk away from Chalk Farm tube station. My apartment has 2 super comfortable King beds and a large veranda with chairs and a sun umbrella so you can dine al fresco. Explore the neighbourhood and enjoy this picturesque part of London. My stylish 2 bed apartment is the perfect base when visiting London. 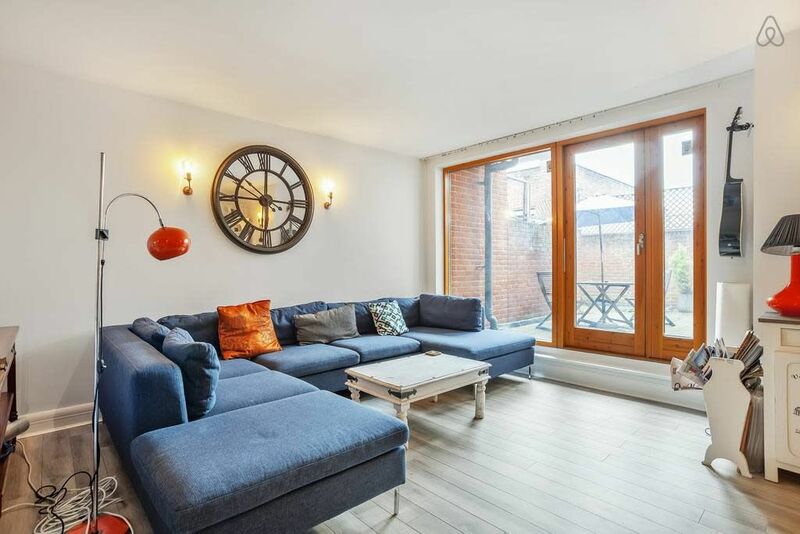 Conveniently located in the exciting area of Chalk Farm and with great transport links, you’ll have easy access to the center of this amazing city, yet be able to escape to total relaxation. The living area is cosy and cheerful with large windows and glass door onto the veranda, making this room lovely and bright. There is a super large sofa, perfect for chilling with friends and relaxing after exploring the buzzing city. It really is an inviting space where you can kick back. With a modern kitchen equipped with easy to use essential amenities, and a large dining area with a lovely wooden dining table, preparing and eating your meals will be very much enjoyable. You’ll enjoy showing off your culinary skills here! There’s even a welcome pack stuffed full of coffee, tea (of course! ), and proper English scones. The master bedroom has a super comfortable King bed and a sleek ensuite bathroom, with a fantastic shower. This, with fresh luxury linens, what more do you need for a good night’s sleep? The second bedroom also has a lovely King bed with lovely big windows, and with large wardrobes, you can get unpacking straight away and really feel like you’re at home, not having to live out of your suitcase. Freshen up and unwind in the main bathroom by enjoying a long soak in the large tub. White fluffy towels and shampoo are provided! You will have the whole place for yourself. management service team who know London like the back of their hand! I trust them to look after you and give you a warm welcome! If you have any questions about your stay, please get in touch through the channel platform. Chalk Farm is the perfect combination of city hub and village-like peace. It’s close to Camden, for those who want to enjoy the area’s vibrant nightlife, but more relaxed and quieter. A huge draw to this area is its proximity to some of London’s most beautiful parks, including Regent’s Park, Primrose Hill and Hamstead Heath. In summer, those who are brave enough can take a dip in Hamstead Heath’s famous swimming ponds! The views from Primrose or Parliament Hill are not to be missed, whilst children will love a visit to London Zoo. Chalk Farm Road is host to many independent, quirky cafés and shops where you can browse for vintage finds. It’s also home to the legendary Roundhouse, one of London’s best and oldest music venues. There are bars to suit all moods, from relaxed pubs like the Hawley Arms, which has a garden and live music, to the trendy Joe’s Bar, perfect for a night-cap. Stables Market is a must-visit - Café Loren is a great spot to stop for coffee or middle-eastern brunch. Also don’t miss the delicious ferrero gelato at Marine Ices… heavenly! Chalk Farm tube station is the nearest station to the property, just a 4 minute walk away. This connects you to the Northern line, meaning you can travel to other areas in no time at all such as the infamous Camden market, and get to iconic London sites such as Big Ben, The London Eye and Buckingham Palace!